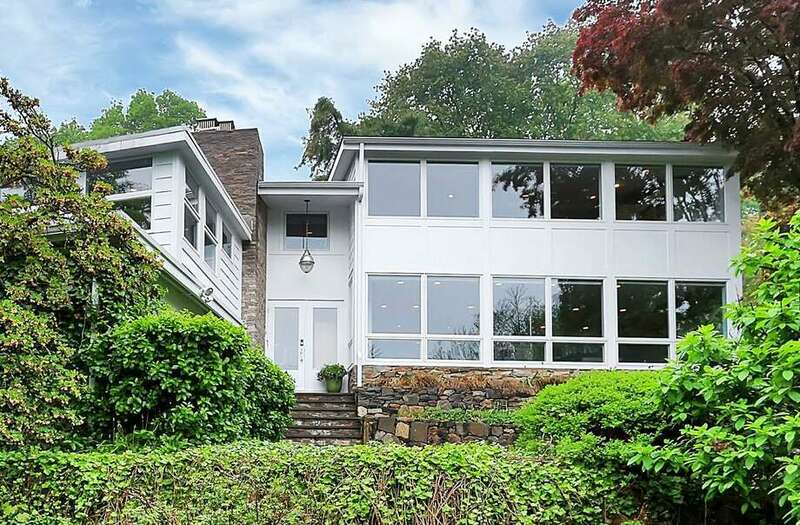 The contemporary house at 221 High Meadow Road sits on a 1.13-acre level and sloping property and is one of the most unusual houses in all of Fairfield; built into rock ledge and containing seven levels. FAIRFIELD — Many of today’s prospective homebuyers are seeking a house that accommodates an indoor-outdoor lifestyle with several rooms containing French or sliding doors that open to stone terraces, patios and gardens. The residents of the contemporary house at 221 High Meadow Road have truly incorporated outdoor living into their interior space that goes way beyond a door to a patio and yard. This unusual house features two interior gardens; one with plantings that would be found in a tropical rainforest and the other a desert garden with plantings that can withstand arid conditions. This house is quite unusual not just for its interior gardens but also for its construction in 1948 on and in rock ledge. One would think such a rocky property would be undesirable but in the visionary hands of Tom Currie it became a “one-of-a-kind” residence. Instead of blasting away the rock ledge to create a flat surface on which to build Currie worked the living space into the rocky setting. He constructed a seven-level house with 4,122 square feet of living space. The rock ledges are part of the interior architecture. Interior stone walls augment the rock ledge for the gardens. “We all dream about our happy years there,” she said, adding that the next owners called it their “dream house.” The document also explains that the property was originally owned by Frank and Elise Shaw who approached Tom Currie about developing a plan “for home lots on a large part of their property,” which had views of Long Island Sound. Currie also had a U-shaped road built with two access points on Mill Hill Terrace. It was given the name High Meadow. “Payment for this extensive job was first choice of all the lots,” Alice Currie said in the document, adding that “our friends thought we were crazy” for the choice they made. Their choice was influenced by Tom Currie’s vision for the seven-level house and because the lot came with a “very fine fenced-in tennis court as well as a lovely rock garden.” The tennis court, one of the oldest in Fairfield County, according to one of the owners, sits across the street from the house. According to the agent, this house is a perfect blend of Mid-Century Modern design and fully renovated spaces. It sits on a property of just over one acre and has gardens outside as well as in. Because of the home’s numerous windows and its location on a hill the view makes it feel as if it is a treehouse. The home has an incredibly versatile living space design that is able to accommodate a wide variety of lifestyles. Enter the first or ground level of the house from a door off the driveway or climb the stairs to the French doors of the formal front entrance, which open into the dining room on level two. When the house was first built there was a fieldstone fireplace in the dining room. It may still exist but it is not visible. It may be hidden behind a wall. The first level features a living room, kitchenette, full bath, storage, and the mechanicals room. This level could serve as an in-law or au pair suite, an office, or game room. The kitchen is on the second level. The living room is on the third level and has stone tile flooring and a wall of windows. The garden room or solarium is on level four and contains two staircases. By the desert garden there is a door to the slate patio and backyard, which is beautifully landscaped with perennials and specimen plantings. One leads to level five, which has three bedrooms and a full bath. The other leads to level six, the spacious master suite, which features a fireplace, sitting area, built-in dresser drawers, wall-to-wall carpeting, a walk-in closet, a full bath, and a private exterior entrance and exit to the yard. Sunrise from the master bedroom’s wall of windows is breathtaking, according to the current owners. In the kitchen there is an eat-in area with a built-in banquette, a glass tile backsplash, granite counters, stainless steel appliances, and a built-in wine rack. Stairs lead from the kitchen up to the family room on the seventh level, which has a fireplace, and a door to a slate patio and shed. For more information or to make an appointment to see the house contact Katie O’Grady of Katie O’Grady & Company/William Raveis Real Estate at 203-913-7777 or katie.ogrady@raveis.com.